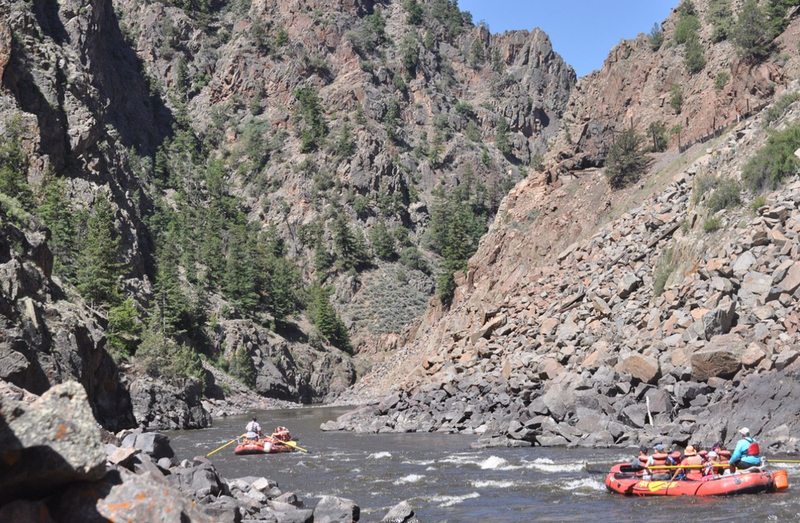 Rapid Transit Rafting - Providing family raft trips with transportation from Estes Park for 37 years! Rapid Transit Rafting is Estes Park’s only hometown rafting company. We’re the only rafting company providing transportation from Estes Park to the river so you can spend less time driving and more time enjoying your vacation. We offer half-day and full-day rafting adventures with transportation from Estes Park on every trip, every day. Our office is the red log cabin right in downtown Estes across from Bond Park. Rapid Transit Rafting is a licensed outfitter under Colorado Parks and Wildlife with special use permits with the Roosevelt National Forest and Bureau of Land Management. Proud members of the Colorado Rivers and Outfitters Association.